August 29 (Cubadebate) After awaiting the fall of Cuba like a ripe fruit for quite some long time, and shaking the tree hard, the United States has recognized a couple errors in its ambitious plan to take possession of the island. Concretely, the advisory on trips to Cuba by U.S. citizens is now a level two warning that recommends exercising caution. Previously, the U.S. had unjustifiably described the country as unsafe for U.S. citizens, issuing a level three warning, with four being the highest, suggesting that travel to Cuba be reconsidered, despite the international prestige the country has gained as a safe destination, including an Excellence Prize from the 38th International Tourism Fair in held in Spain. In terms of the reduction of accredited diplomatic staff in Havana, motivated by alleged sonic attacks which have never been proven, the Congressional Research Service (CRS) reached the conclusion that this move has had a negative impact. Representative Eliot Engel, a Democrat from New York District 16, stated that he had requested an analysis from the CRS on the situation at the U.S. diplomatic mission in Havana, which indicated that personnel had been reduced to 14 staff members, from a total of 50. Additionally, the issuing of visas in Cuba for both immigrants and non-immigrants was suspended, and 17 Cuban diplomats in Washington were expelled from the United States. Since these unilateral measures were adopted, the Cuban government and groups within the U.S. – including elected officials – have warned that families in the two countries are negatively impacted, and expressed concerns that the U.S. would not fulfill its commitment regarding the awarding of visas. Among the problems created by the measures, the Congressional Research Service notes that the majority of Cubans requesting visas must do so at a U.S. embassy or consulate in another country, making visits to see family in the U.S. much more difficult. At the same time, Cuban professionals from the private sector and some cultural groups have been obliged to cancel activities in the U.S. as a result of the complicated visa request process. The numbers speak for themselves. Despite the 1994 migratory agreement between the two countries, which establishes that the U.S. will award a minimum of 20,000 visas a year to Cubans, over the first nine months of 2018, less than 4,000 have been granted. 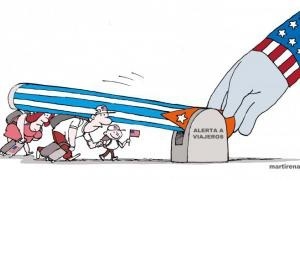 Nevertheless, for the U.S. giant always awaiting Cuba’s fall, these mistakes are only considered erroneous to the degree that they fail to advance the country’s strategic goal. Worth noting is the conclusion drawn in the CRS report that the staff cut in Havana “potentially diminishes the ability of the State Department to understand the situation on the ground,” and continues to justify its softened warning on travel to Cuba with references to unproven attacks on U.S. diplomats in Havana.